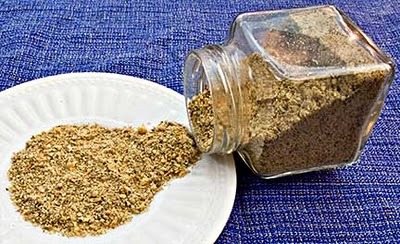 Dukkah is a Middle Eastern nut, seed, and spice mixture. To eat Dukkah like an Egyptian, follow Nawal’s instructions and dip bread in oil and then in Dukkah. You can also mix Dukkah and olive oil for an easy, last-minute appetizer. Dukkah is good on potatoes, hard boiled eggs, roasted vegetables, or sprinkled over a plate of feta cheese, fresh tomatoes, and sliced cucumbers. Fish, chicken, and lamb all benefit from a dusting of Dukkah. The spice combination in this recipe is my own; the technique for roasting nuts and spices was adapted from Rose Levy Berenbaum. Put almonds on baking sheet. Put sesame seeds, cumin seeds, and coriander seeds in three separate oven-proof baking cups, and put cups on baking sheet. Roast cumin seeds for five minutes, coriander seeds for seven minutes, and almonds and sesame seeds for 10 minutes. Grind black peppercorns, cumin seeds, and coriander seeds in spice grinder until they’re roughly ground (or you can pound them in a mortar and pestle). Put in bowl large enough to hold all the ingredients. Grind sesame seeds and then almonds until roughly ground and add to bowl (almonds should be slightly chunky). Add salt and sugar. Mix all ingredients together. Store in refrigerator or freezer.